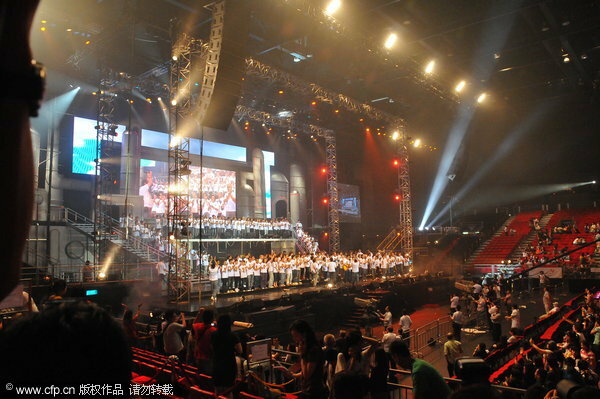 Over 100 artists from Mainland China, Hong Kong and Taiwan are taking part in the"Artistes 88 Fund Raising Campaign" at the AsiaWorld-Expo in Hong Kong Monday, Aug. 17, 2009 to benefit flood victims in Taiwan. Various top Hong Kong singers join the fundraising concert on Monday including Jacky Cheung, Aaron Kwok, Leon Lai, George Lam, and Alan Tam. Hong Kong singer/actor Andy Lau and more than a hundred Hong Kong artists gathered on last Saturday to record a song for the fundraiser. The song is an adaptation of Simon and Garfunkel's "Bridge Over Troubled Water" and is sung with Chinese lyrics. Hundreds of artists wearing white T-shirts recorded the piece from 11 pm until early Sunday morning. Andy Lau said, "We are still planning the action for future relief. Me, Eric Tsang, and Alan Tam will consider what to do to continue the effort. I think the artists in my generation cannot separate from the Taiwan audience. We got their support and built our careers since we were young. I hope we can do something. I will be with you all the way to get through it." Typhoon Morakot dumped more than 2 meters of rain on the island and stranded thousands in villages in the mountainous south. More than 21-thousand villagers were ferried to safety, and rescuers were working to save another 4-thousand plus. The storm destroyed the homes of 7,000 people and caused agricultural and property damage in excess of 50 billion New Taiwan dollars (around US$1.5 billion).